@mimiandant this sounds good I’ll certainly have to try it!…BTW I love your “By God’s Grace”, it is how I finish off my letters / comments most of the time as well. @mimiandant diet is a big issue when considering regular bowel movements. I attempt to stay away from greasy, spicy, ruffage, etc. foods eating mostly grilled, baked, broiled foods, that being said, I’m on no particular diet. I only take careful precautions over my ‘cravings’ taking the outcome as my primary focus. One thing I’ve noticed is I must stay away from is black pepper (mainly cracked peppercorns), corn, oats, etc…I stay away from fresh/uncooked vegetables. My BIGGEST change has been hydration…water, water, water! As mentioned, every time I attempted this my urine output was excessive, with my busy schedule was difficult, but my body adjusted after 3-5 days. @gailfaith I am down in Blackshear Georgia….I have read your PT exercise practices, just noticed that our discussion actually started way above back on Nov 5th. I’m signing off for the night as well, I;ll reply back later. @gailfaith I would’ve loved to read it, maybe you could rewrite later? 1) “what does GNEM stand for?”…GNE Myopathy but I’m unsure what “GNE” means, see link below for more. 2) What is “MDA Clinic?”…It’s a annual clinic provided by MDA that’s intended to address the progression of MD patients, as well as, provide important information about your dx & support. @hopeful33250 yes I’m well, just now seeing this. Prior this conversation many things were taking place, both tough & miraculous, then after this conversation took place, many tough & miraculous things took place, as this testimony explains. Even ended up in the hospital the first week of December because of another virus & dehydration, but the outcome shall always be blessed. So much vision on my limits, which is not my specialty, has hindered me this past year…but I’m an overcomer! I had a MDA Clinic update 2wks ago…After 27+yrs of Muscular Dystrophy, I’ve never received a exam so thoroughly performed than the one at Mayo Jax! The NEWS received was NOT what we were EXPECTING! The doctor stated that he was ‘expecting’ that I have GNE Myopathy which is the absence of sialic acid, causing muscles waste over time leading to severe disability. Here’s the “WOW” point! They are currently involved in phase 3 clinical trials where if it goes as the doctor expects, I could possibly participate in these clinical trials! These trials have been productive, even possibly providing muscle regrowth or stopping future muscular waste!!! Am I ‘overly’ expecting that I’ll soon be regaining muscles or even preventing future waste? No…But I believe that God raised dry bones to life in Ezekiel 37; therefore I’ll say as Ezekiel did “O Lord God, You know.” then I’ll continue as he did by prophesying “you shall live. I will put sinews (muscles) on you”! I have hope, belief, & faith that it’s in God’s hands, and it’s all for His glory, my prayer is that “God’s will be done”! Now, here’s the description of GNE Myopathy, which is remarkably “spot-on” for my early symptoms & the past 27+yrs! On top of that, I’m thinking about freelance writing & going back to college for Graphic Design degree! Love D. Jeremiah I listen through Audible due to disability & I just added it to my wishlist. 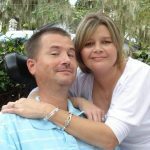 I am fairly comfortable w my disability, but there’s times of course when I have a hard time, I get sick, wife gets sick, or I just get tired of ‘not doing’ anything. Those times get me down, but I do good not letting others see it or hear it. You see I’m either out going (driving my chair) or fellowshipping or I’m on my laptop…those are my choices, my muscles are so weak I can’t dial a phone, use a remote or tablet, write, etc. Example this week I’ve been sick, stomach bug, so I’ve been in bed a lot, now my wife’s sick & it’s overwhelming doing the same thing over & over…so yeah, I’m not SuperHero or nothing….I actually needed to vent that, because this week I’ve been bed bound 4 days…I’m tired of staring & clicking at this laptop! …Thank you! Enjoy the finer things in life, walking a half mile is great. I would love to go for a .5 mile walk, there’s a pleasure in everything if we’ll just look. I truly miss fishing & walking through the woods, when I begin meditating on that, I then begin to think “If I just had strength in my arms, physically I’d have no limits”! That’s when I start thinking & acting negatively…Like I’m doing now! LOL…It happens sometimes. I love the measuring idea determining the walking distance. My wheelchair has a mileage odometer which reads close to 1,600 miles, which I traveled in it since August 2011. On average that’s around a mile a day, of course by motor power, not physical power. I’ve wondered sense December whether PT would profit me so far into my disease? Tank you…My knowledge of Limb Girdle MD is basic, deep study only confused me & created negative thoughts.